Respilon‘s ReSpimask is a protective medical facemask with advanced nanofiber technology captures 99.9% of smog, emissions, viruses, bacteria, molds, pollen, dust and other dangerous particles. ReSpimask® provides reliable potection from 99.9% of air pollution, allergens and infectious diseases thanks to new revolutionary filter made by RESPILON. RESPILON Protective Facemask was designed to capture all dangerous particles found in the air including viruses and bacteria. RESPILON Protective Facemask provides reliable protection from air pollution, allergens and infections such as influenza and it‘s variants. ReSpimask thanks to nanofiber RESPILON technology inside as you can see on right side, protects you against smog, emissions, viruses, bacteria, molds, pollen, dust and other dangerous particles. 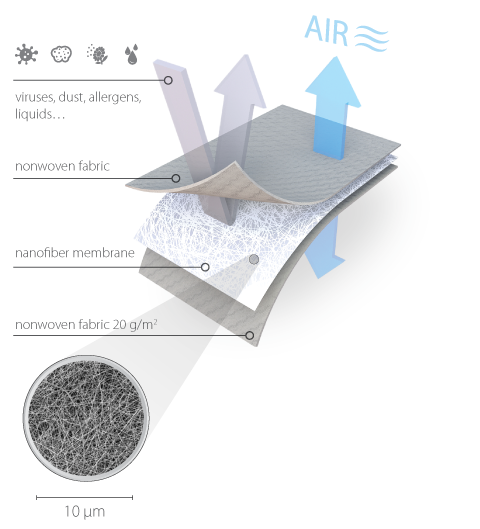 The nanofiber filtration layer in ReSpimask is covered from both sides with nonwoven fabric. The filter covers the whole part of mask where air flows. This RESPILON nanofiber membrane is rated the highest in dense filters on the market but still provides better breathability and higher filtration efficiency then our competitors. On the graph above see what dangerous particles are you protected from wearing ReSpimask. are designed with standards to protect those in the immediate surroundings against the wearer by preventing large particles expelled by their nose or mouth, such as spit or mucous from entering the environment such as in Hospital Operating Room. However, these masks don’t protect the wearer’s respirator system against inhaling dangerous airborne particles. 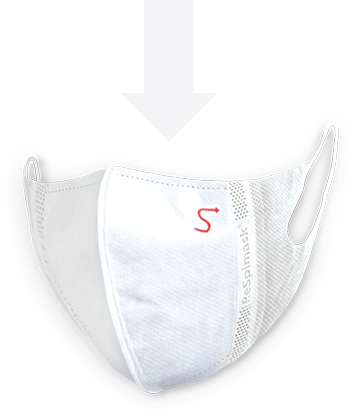 are designed to help protect the wearer from certain airborne contaminants. They also have a close fit around the face to help avoid leaks through which airborne contaminants can enter. But most of the respirators on the market today are not comfortable to wear, are difficult to breath in and do not protect against viruses. Protective mask captures 99.9% of allergens, viruses, bacteria, mold, dust, smog, emissions and other dangerous airborne particles. The Filtration efficiency is equivalent to respirator standards EN-149 FFP1 or US standard N95 as well as EN 14683 – Type IIR Standard for facemasks. The mask is designed for hygienic reasons and can be worn a maximum od 24 hours of use.